The Speak 510 is a personal, easy to use conference call speakerphone with both - USB and Bluetooth connectivity, for efficient and productive conference calls whenever and wherever. 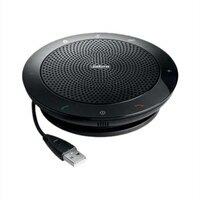 With an optional Jabra link 370 USB adapter* that gives you wireless freedom up to 100 feet /30 meters. Comes with a protective travel pouch.